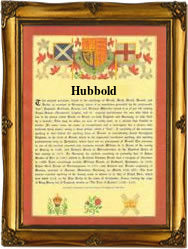 This name, with variant spellings Hubbold and Hubball, derives from the norman personal name Hubald, itself coming from the Old Germanic male given name Hugibald, composed of the elements "hug", heart, mind, or spirit, plus "bald", bold or brave. This name was introduced into England by the Normans, and is first recorded as a surname in the latter part of the 11th Century, (see below). One, Bernard Hubold appears in the 1148 "Winton Rolls of Hampshire" and a Henry Habalt in the 1205 "Pipe Rolls of Warwickshire". On January 28th 1570, Mary Huble, an infant was christened in St. Nicholas, Cole Abbey, London and on June 23rd 1583 Morgaine Hubble and Tomison Malestone were married in St. Antholin's, Bridge Row, London. The christening of one, Samuel Hubball took place in St. Andrew's, Holborn, on January 8th 1692. The first recorded spelling of the family name is shown to be that of Hugo Hubald, which was dated 1086 in the Domesday Book of Bedfordshire, during the reign of King William 1, known as "The Conqueror", 1066 - 1087. Surnames became necessary when governments introduced personal taxation. In England this was known as Poll Tax. Throughout the centuries, surnames in every country have continued to "develop" often leading to astonishing variants of the original spelling.